This interactive training program will help undergraduate choral music education students understand more fully the role of the choral conductor during rehearsal. Specifically, this program will focus on the choral conductor as a problem solver and reflective educator. Through interaction with this program, students will encounter common problems in the areas of tone, blend, balance, intonation, diction, and rhythmic integrity and they will learn how to solve these problems effectively and efficiently. Furthermore, students will learn how experienced conductors address choral problems and the dynamic mix of problem solving techniques that are implemented as they solve choral issues during live rehearsal sessions. The rationale from this project is based on prior research that was documented in an unpublished paper entitled "Interactive Multimedia Instruction: Developing a Model for Use in Choral Music Education". 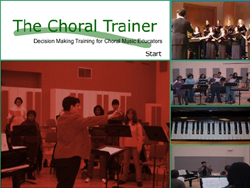 This paper describes the benefits of producing a multimedia program for the purpose of providing pre-service choral students with a basic model of problem solving techniques. Our intent is to produce both a stand-alone Computer Based Training (CBT) and a Web-based Training (WBT) application for delivery via CD-ROM and distance learning formats.